Calling all Beer Lovers of the Far North! Marc, James welcome you to U-BREW IT CAIRNS! 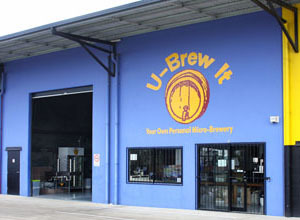 Now in its fourth year of operation, U-Brew It Cairns has attracted an enthusiastic following of regular local brewers, who can’t get enough of our fantastic naturally brewed beer! We provide a relaxed, friendly environment so you can enjoy brewing your favourite Aussie and imported beers on our premises. There are 150 varieties to choose from including Ginger Beer, Red Dragonfruit Infused Cider and the good old Stout. While you’re brewing, why not partake in a Free Beer Tasting. You can also grab a Souvenir Six Pack ($15 ea) to take home! Bottling or canning your brew is easy and fun! Bring a mate and it’s even better! 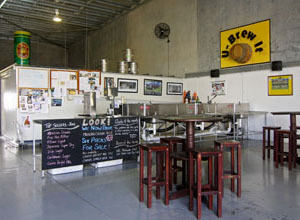 Basically it’s a bloke’s paradise – somewhere to unwind whilst doing the very important task of bottling beer! One brew equals 6 cartons of beer, so many of our regulars team up with a mate to share their brew. But we are now offering one third brews too – so you can brew 2 cartons instead of 6. That means more variety, less expense up front, less fridge space needed at home, and less time to bottle it! Why not setup your own bar with beer on tap at home! Our team can help you redesign your fridge with beer taps and gas, or you can order a Keg King Kegarator through us. As a distributor for Keg King, we can order in any specialised equipment you need from converting Soda Stream Gas Bottles to operate on kegs to setting up your own Extract or Full Mash Home Brewing System.